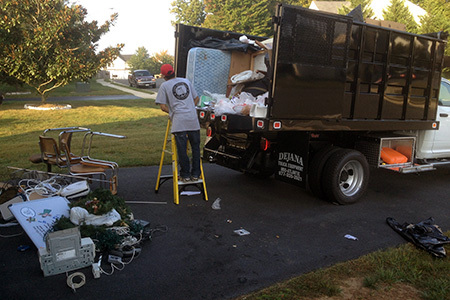 Mack Hauling is a junk removal company serving the City of Alexandria Virginia area. Schedule your pick up by calling us or complete our FREE ESTIMATE request form. We travel regularly down roads near W. Braddock Rd, Duke Street, King Street, Eisenhower Ave., Route 495, Route 395, Route 1, Route 7, S. Henry, S. Patrick St., N. Washington St. George Washington Memorial Pkwy., Cameron St., Columbus St., Prince St., Braddock Rd., Glendale Ave, Bellefonte Ave, Mount Vernon Avenue, Seminary Rd., Beauregard St., Chambliss St., Jefferson Davis Hwy., and more. We have many satisfied customers in or near the City of Alexandria including areas such as: Gunston Hall, The Lyceum, Carlyle House, Carlyle House, Asher Apartments, Belle Pre Apartments, Del Ray, Woodland, Bolling Brook, Newport Village, North Hampton, Avana Alexandria Apartments, Hillwood, Stoneridge, West Village of Shirlington, Windmill Hill Park area, Jones Point Park area, Shipyard Park area, Oronoco Bay Park area, Montgomery Park area, Daingerfield Island, Hollin Hills, and many surrounding areas.